I don’t know if I’m alone in this feeling or not, but there are a few authors whose work I always enjoy and yet for whatever reason, I don’t seek them out. Yet when I come across one of their books I think, “Oh yeah, I like this writer.” David Housewright is one such author for me. 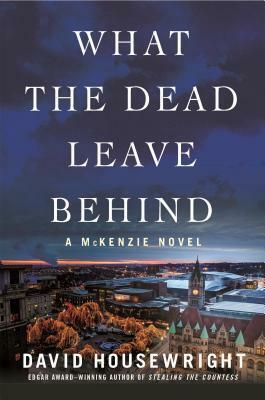 What the Dead Leave Behind is the fourteenth book in Housewright’s Rushmore ‘Mac’ McKenzie series. McKenzie is a former St. Paul, Minnesota police detective who, years ago, accepted the reward money for the solving of a crime, even though it was through his police work – a decision that made him a millionaire and for which he has taken a lot of flack. Now he does some detective work – usually getting beaten up along the way – as a favor for friends in need. Here the request for help comes from his step-daughter, Ericka. The father of Ericka’s friend, Malcolm Harris, was found murdered in a park the year before in a Twin Cities suburb. With not many clues to go on, the case has gone cold and Malcolm isn’t handling it well. Mac starts looking into it and his investigation takes him from suburban hot-dish groups to corporate espionage and bar brawls to shootings. I started reading the Mac McKenzie books because of the Minnesota connection (being Minnesotan I enjoy books written by Minnesotans and featuring Minnesota landscapes). But once I get into the books, I stay with them because of the character of Mac McKenzie. In part he’s a throwback to the Sam Spade-like, hard-boiled, noir detectives of the 1930’s. But he manages to live comfortably in the modern day. He’s no Luddite, despite his throw-back toughness. And make no mistake, McKenzie is tough. He takes a beating that would kill a normal man. Said beating is so intense it almost becomes laughable that McKenzie survives. Almost. Housewright pushes the scene to the very edge, maybe toes just over the line, and then pulls it back. And like all good literary PIs, McKenzie has a code of ethics that he lives by. He’s in a committed relationship, but enjoys flirting with the attractive women he meets. And while he might be tempted to go beyond flirting, he manages self-restraint. The story here is quite interesting and while I can’t say that I saw the ending coming, it also wasn’t a surprise. This is a good detective mystery with a great character in the lead. Looking for a good book? What the Dead Leave Behind by David Housewright is the fourteenth book in the Mac McKenzie series and judging by the strengths of this volume the series is going strong and will be around for many more volumes.